"Chubby Elephant Diaper. Handcrafted with Love for your Chubby Elephant." This is definitely true of my little man. At 8 months old and weighing in at almost 22lbs, he is definitely my little chubalub. We decided to cloth diaper long before he was ever born, and I had thought about it before he was even conceived. Needless to say, I love trying out different styles and brands. 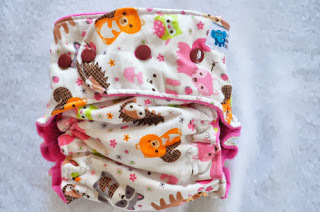 I have been hearing a lot about AI2 diapers and I have no experience with them. 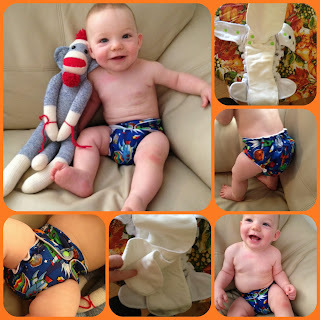 I have used both fitted AIO but mostly pocket diapers. I decided to try something new with the A12. I was sent the larger size (she makes small which is good for 10-20lbs) and the larger which works for 17-35lbs. My little guy is close to 22lbs, and kinda thicker through the midsection, and this diaper fits him great. There is definitely not any room to overlap the waist, but there is still room for growth. The diaper fits snug around his legs, and does not leak at all. Technically because of the way this is made, baby has 6 layers of organic fleece between him and the outside of the diaper, so this means you do not need a cover. That being said, my little boy is a VERY heavy wetter, and I did notice the outside got damp, but I am totally okay with that. We really only wear cloth diapers at home, with a t-shirt or completely alone, so the dampness is good for me to know when he needs a change. 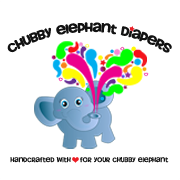 Please enter my giveaway for a Chubby Elephant AI2 Diaper which begins 10/1/13 and ends 10/15/13.